Most carpets come in 12′ widths; some are available in 15′ widths. If your room is larger, you may require more carpet to cover areas that will be matched and seamed together. It’s a good idea to always have the installer double check the measurements prior to purchasing the carpet. Be sure to measure from the furthest point of the room. If you’re planning on carpeting your closets etc, you need to measure from the furthest point inside the closet to the furthest point opposite that closet. Do the same for north and south then east to west of the room requiring flooring. 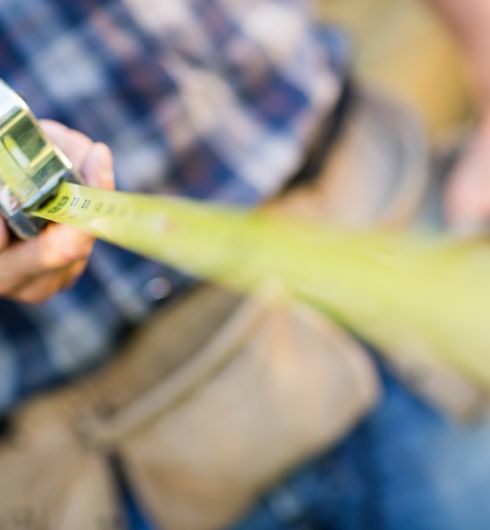 If you are measuring for tile, the same would apply – except after you have figured length (in feet) x width (in feet) do not divide by 9. This number is the total square footage needed. Carpet, vinyl and other types of wall base will be measured a bit differently. As always to be safe we recommend having a professional installer measure your area for proper ordering. *Note that certain floor covering materials may require a certain amount over the actual measured area to be needed. Ceramic, resilient tile and wood flooring which may require a lot of cuts, custom shapes or designs and carpets designed with a pattern are inclusive of such ordering needs. Also, resilient tile and V.C.T. usually are sold in boxes of 45 Sq. Ft. per box, thus having extra tiles leftover. This is a good thing because scuffed and or severely damaged tiles can be removed and replaced. Many customers wanting to install their own product can find that spending $25 to have it measured for them by a professional will save them more than time and money. Also having a professional perform the installation of your floor covering will ensure that the manufacture of such product will honor any intended warranties. Improper installations are the number one cause of manufacturer warranties not being honored. Once the product is ordered it is cut to the measurement you give. If too much product is ordered there is a possibility of taking care of that spare room or closet. However if not enough material is ordered getting the remainder needed to complete the job may mean getting a piece that is of a different dye lot (not matching color) and unnecessary seams in areas you may not have planned for. Seams, when required, can be a nuisance. If at all possible you never want to place a seem in a high traffic area. Many people want to save the extra money it may cost to ensure your flooring is done correctly. If you have any questions that were not answered for you here, you are welcome to stop in or call us.